The causes and consequences of disturbances are major research topics in landscape ecology (Ecosystems 1:497–510, 1998; Prog Bot 62:399–450, 2001; Annu Rev Ecol Evol Syst 36:319–344, 2005; Ecology 91(10):2833–2849, 2010). Disturbances are of particular interest because of their reciprocal interactions with landscape pattern—they both respond to and create spatial heterogeneity (Landscape heterogeneity and disturbance, New York, 239, 1987). Understanding the disturbance-created landscape mosaic is important for conserving resources and biodiversity, anticipating potential consequences of global change on disturbance regimes (Ecology 91:2833–2849, 2010), and managing landscapes in ways that mimic attributes of natural disturbances or keep a landscape within its historic range of variability (Emulating natural forest landscape disturbances: concepts and applications, New York, 2004; For Ecolo Manage 257:1868–1873, 2009). The spatial patterns created by disturbances can also provide novel insights into the state and dynamics of a landscape (Ecol Lett 11:756–770, 2008). 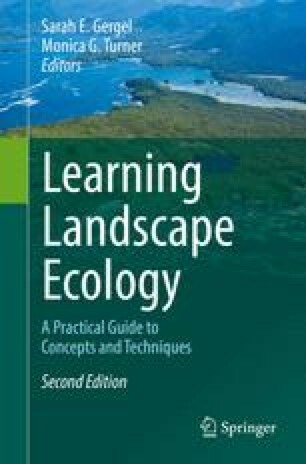 Thus, disturbance has been a primary focus of landscape ecology for a long time (e.g., Landscape heterogeneity and disturbance, New York, 239, 1987).